Drowning of Mattheus Mair, Wier, 1592. 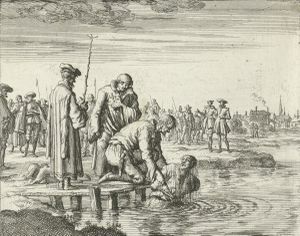 Engraving by Jan Luiken in Martyrs Mirror, v. 2, p. 788 of Dutch edition. Matthias Mair, a Hutterite martyr, a native of Tyrol, Austria, chosen deacon in 1551; betrayed by a priest, who sent his cook after him to detain him under the pretense that she wanted to become an Anabaptist, he fell into the hands of the Catholic peasants at Wier near Vienna, was taken to Baden, and after six days of imprisonment, during which the priests tried in vain to convert him, he was drowned on 27 July 1592. Three or four times the executioner pulled him out of the water to ask him whether he would recant, but he refused as long as he could speak. His death produced excitement and disappointment among the people, for he was known as a good and upright man. He and Thoman Haan are mourned in the song (20 stanzas), "Trost, Fried und Freud, Standhaftigkeit im Herren." Beck, Josef. Die Geschichts-Bücher der Wiedertäufer in Oesterreich-Ungarn. Vienna, 1883; reprinted Nieuwkoop: De Graaf, 1967: 317. Braght, Thieleman J. van. Het Bloedigh Tooneel of Martelaers Spiegel der Doopsgesinde of Weereloose Christenen, Die om 't getuygenis van Jesus haren Salighmaker geleden hebben ende gedood zijn van Christi tijd of tot desen tijd toe. Den Tweeden Druk. Amsterdam: Hieronymus Sweerts, 1685: Part II, 788. Braght, Thieleman J. van. The Bloody Theatre or Martyrs' Mirror of the Defenseless Christians Who Baptized Only upon Confession of Faith and Who Suffered and Died for the Testimony of Jesus Their Saviour . . . to the Year A.D. 1660. Scottdale, PA: Herald Press, 1951: 1089. Available online at: http://www.homecomers.org/mirror/index.htm. Hege, Christian and Christian Neff. Mennonitisches Lexikon, 4 vols. Frankfurt & Weierhof: Hege; Karlsruhe; Schneider, 1913-1967: v. III, 1. Die Lieder der Hutterischen Brüder: Gesangbuch darinnen viel und mancherlei schöne Betrachtungen, Lehren, Vermahnungen, Lobgesänge und Glaubensbekenntnisse, von vielen Liebhabern Gottes gedichtet und aus vielen Geschichten und Historien der heiligen Schrift zusammengetragen, allen frommen Liebhabern Gottes sehr nützlich zu singen und zu lessen. Scottdale, Pa. : Mennonitisches Verlagshaus, 1914. Reprinted Cayley, AB: Hutterischen Brüdern in Kanada, 1962: 797. Wolkan, Rudolf. Geschicht-Buch der Hutterischen Brüder. Macleod, AB, and Vienna, 1923: 437 f.
Wolkan, Rudolf. Die Lieder der Wiedertäufer. Berlin, 1903. Reprinted Nieuwkoop: B. De Graaf, 1965: 236. Zieglschmid, A. J. F. Die älteste Chronik der Hutterischen Brüder: Ein Sprachdenkmal aus frühneuhochdeutscher Zeit. Ithaca: Cayuga Press, 1943: 565 f.
Neff, Christian. "Mair, Matthias (d. 1592)." Global Anabaptist Mennonite Encyclopedia Online. 1957. Web. 19 Apr 2019. http://gameo.org/index.php?title=Mair,_Matthias_(d._1592)&oldid=144316. Neff, Christian. (1957). Mair, Matthias (d. 1592). Global Anabaptist Mennonite Encyclopedia Online. Retrieved 19 April 2019, from http://gameo.org/index.php?title=Mair,_Matthias_(d._1592)&oldid=144316. Adapted by permission of Herald Press, Harrisonburg, Virginia, from Mennonite Encyclopedia, Vol. 3, p. 442. All rights reserved.